One tried and true way of keeping track of money, getting out of debt, and staying out of debt is to use budgeting. Figuring out where your money goes each month can help you stay on top of saving and you may even find you have more "spare" money than you thought. For most people, doing a monthly budget makes the most sense. 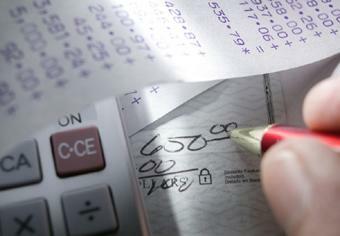 Bills usually come monthly, and paychecks are issued weekly, bi-weekly, or monthly. Plus, it makes for a quicker "snapshot" of where money goes. For a better idea of your spending habits, you can keep track of your spending for three months, but for the purposes of this article, we'll use a monthly scheme. If you receive some bills yearly, like insurance or payments for life insurance, be sure to divide that bill by 12. That should be the amount set aside a month in order to pay those bills without dipping into savings. Add up the take-home pay of all earners contributing to the household. Subtract the amount of the monthly bills from the take-home pay. To keep yourself debt free, experts also recommend the theory of "paying yourself first", usually by saving 10 percent of take-home pay. This isn't necessarily an expense, but should be subtracted from the collective amount. Any extra money can and should be used for extra retirement savings, kids' college funds, or paying down debt. Ideally, experts recommend having access to anywhere from three-to-six months worth of savings that would cover monthly bills, in case of emergency. Another form of savings involves setting aside an amount of money per week or month that you can later spend on whatever you like, whether it is a night out on the town, a fancy outfit that you want, accessories for a motorcycle, or a big vacation. Knowing that you have this allowance can help keep you from running up credit card bills on unnecessary items or binging with big shopping trips you cannot afford. If you ended up with a negative number when you subtracted your expenses from your take-home pay, it usually means you are in debt. For some people, eliminating debt may be as simple as making a few changes to their lifestyle in order to bring themselves back into the clear. For example, start cooking instead of eating out four or more nights a week. Cut down on movies and drinks out with friends. Entertainment is usually the easiest place to trim down the budget. Cutting back on a cell phone plan. If you find you use less than half of your minutes, you probably do not need as big (and expensive) of a plan. Shop around for vehicle insurance. Check out comparison Web sites for the best deals. Change your cable or satellite television package. Do you really need all 250 channels? Put your credit cards away, except one for emergencies. Even if you think all of your charges are really necessary, you may find your bill going down if it's not in your wallet. If you are in severe credit card debt, consider using the money you come up with to make bigger payments on your highest interest cards. Or, if you find your vehicle payment and related expenses seem out of proportion, it may be worth looking into a cheaper, more fuel efficient car or truck. Moving to a cheaper rental unit may also be an option if living expenses are too high, but do not forget to factor in moving expenses themselves. For those who come up with a very large negative number, it may be helpful to speak with a consumer debt or credit counselor to help get yourself back on track. They may recommend certain techniques based on your lifestyle and spending personality, or they may recommend a debt consolidation program. Don't forget that putting away a little money goes a long way to building your emergency savings fund. Even if you can only spare a measly $10 a week at first, start putting it into a savings or money market account. As you pay down the rest of your debt, gradually add more money each week to that amount. Once you have your emergency savings built up, look into more long-term savings options. Paying off debt while saving at the same time can help you see the results of your efforts more effectively. Visit Dave Ramsey's Web site for money, debt, and budgeting. Check out FinishRich, a site dedicated to followers of David Bach's Automatic Millionaire programs. Read the book The Money Book for the Young, Fabulous, and Broke by financial and debt expert Suze Orman, or any of her other books. Visit the Motley Fool's Web site and post questions on their financial forums. Try out a budgeting software program like Quicken.